TNPSC Group 1 mains examination consists of three descriptive papers. The Group 1 mains question paper provided below is from the TNPSC group 1 Mains 2015 Exam dated 5th July 2015. We hope this question paper will be very useful for your upcoming TNPSC Group 1 and Group 2 mains Exams. You can also consider this mains question paper as a Model Question Paper for TNPSC Group 1 and Group 2 Mains Exams. 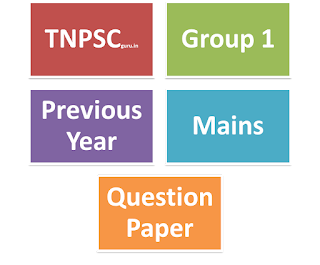 For More TNPSC Group 1 Previous Year Prelims and Mains Question Paper Visit Here.